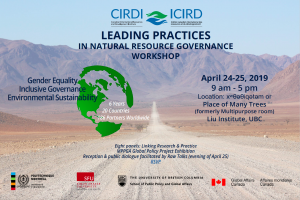 The Canadian International Resources and Development Institute (CIRDI) is pleased to invite you to our Leading Practices in Natural Resource Governance Workshop. The workshop will feature participants from Argentina, Ecuador, Ethiopia, Guyana, Kenya, Mongolia, Peru, Senegal and Canada, representing academia, government, civil society, and industry. The panels will reflect on gender equality, inclusive governance and environmental sustainability within the natural resource sector, while also examining the links and tensions between research and practice in international development projects. CIRDI was founded in 2013 by three leading universities: University of British Columbia (UBC), Simon Fraser University and Polytechnique Montréal, and is now housed within UBC’s School of Public Policy and Global Affairs. Since its founding, CIRDI has become a trusted inter-disciplinary centre of expertise on natural resource governance and related policy, management and sustainable development. With Canadian and international partners, CIRDI has been providing leading-practice advice, technical support, training and applied research, and established itself as a platform for innovative thinking, knowledge mobilization and shared learning. Over the past five years, CIRDI has delivered programming across 22 project sites, with 186 partners, including academic institutions, local communities, embassies, industry associations, international and regional agencies, NGOs and non-profits, and private and government partners. The initial suite of projects delivered under CIRDI’s founding Contribution Agreement with Global Affairs Canada (GAC) is in the final stages of implementation and is due to conclude this spring. This provides a timely opportunity to consolidate research, project outcomes and lessons learned across all our projects. Please RSVP here as there are limited spots available. Public dialogue and reception by Raw Talks: 5:30 pm – 8:00 pm, April 25, 2019. A separate invitation to follow. 2:00 PM – 3:20 PM What Does Effective Multi-Stakeholder Consultation Look Like? Participatory development underpins all of CIRDI’s work. This includes multi-stakeholder dialogue, promoting community voices and supporting local innovation. Yet in practice, what does inclusive and responsible mining that look like? What are examples of leading engagement practices? This panel brings together a small-scale miner, industry consultant, government representative and academic to discuss effective stakeholder engagement from different perspectives. Ian Thomson, Principal – Shinglespit Consultants Inc. Although Canadian indigenous issues have not been a focus of CIRDI’s work, there are opportunities to reflect upon the relevance of project outputs at the local level, as well as to identify avenues for future work. Social learning was adopted by CIRDI’s Trans-MAPE project team to help them respond to the realities of ASM in Ecuador. Using this learning model, the team first emphasized the importance of non-hierarchical relationships, collaboration and trust in their learning processes, while mutually exploring ASGM-related issues with diverse stakeholders and actors. Second, the project team promoted social co-learning aimed at building the capacity of those involved in the critical evaluation of existing ASGM knowledge and environmental challenges, ASGM knowledge generation and penetration, and the application of knowledge to policy and practice related to ASM. This panel brings together a small-scale miner, the project lead, and the project’s academic lead to share their experiences. Participatory processes of environmental governance are taking place the world over. In many countries communities and civil society organizations play a key role in monitoring environmental issues related to water, contributing to community education and land rehabilitation of degraded areas. Drawing on the knowledge and applied experiences of academics, community leaders and practitioners, this panel will reflect on community participation in environmental governance, with special attention paid to experiences influenced by ASM and LSM mining regions. Most of CIRDI’s projects have involved working with government partners to develop public sector capacity in the natural resource sector. This panel will provide an opportunity to hear directly from four government partners from CIRDI projects in Argentina, Ethiopia, Peru and Senegal. These partners have been deeply involved in CIRDI’s work and will share their experiences to identify commonalities in approaches and practices that have led to successful project results. These context-specific insights can highlight leading practices in public sector capacity development projects, and can inform future research and work in natural resource governance. The event will be live-streamed on CIRDI’s Facebook page. This event has been made possible with financial support from Global Affairs Canada.